Do you have someone in your life who is just plain hard to love? You know, a person you have poured into time and time again. You’ve invested. You’ve given your time, money–your heart. And you’ve gotten nothing in return. Nada! In fact, it seems every time you reach out, you get your hand slapped. Your good intentions back fire. You try to build a bridge only to have a match lit and the bridge burned to the ground. Yeah, I have a someone like that in my life. And after getting shark bit for the umteenth time, I had decided I was done! Done investing. Done trying. Done reaching out. Done building a relationship. Done planting. Done. I was ready to throw in the towel. 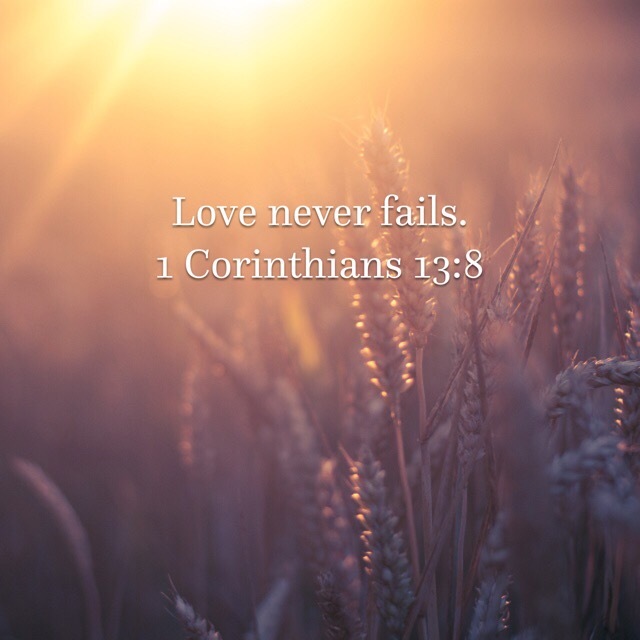 The only problem was this little phrase in 1 Corinthians 13:8 that kept replaying in my mind. I wrestled with God on this one. I laid out my case and gave Him my list of reasons for walking away. I felt like it was a pretty rock solid case if I do say so myself. Really God? Never? But isn’t that a little too definite? Shouldn’t that verse say “Love ‘sometimes’ fails?” That has a nice ring to it, don’t ya think? There’s got to be some good reasons why love “sometimes” fails! My friend Dana reminded me of what Jesus did for us on the cross. Did He give up on us? Did Jesus’ love ever fail? No. As Max Lucado says so beautifully, “Nails didn’t hold Jesus to the cross, love did.” If anyone had a good reason to give up on love, it was Him! But He didn’t. And neither can I. Sometimes I want to, but I can’t. Loving like Jesus isn’t easy. It’s actually impossible without Him. Something the Lord is showing me is I’m not capable of loving anyone without Him. Another thing I’m learning is I can’t change people. Only God can. That’s His job, not mine. I get too big for my britches when I try to take on God’s responsibilities. He has called me to plant the seeds, not make them grow. I can plant and I can water, but only God can cause the seeds to grow and produce change in other people’s lives. That verse was groundbreaking for me! That’s where I have been messed up in my thinking. I want to see the results from my labor in the soil I’m planting in. I want to see change. I want to reap a harvest. I want evidence and proof that I’m not planting in vain. And when I don’t see results, I’m ready to pack up my sack of seeds and move on to a new field. But here’s what He’s showing me. I’m not going to be judged by the results of the harvest. I’m held accountable for my faithfulness to plant. My job is to keep planting. To keep obeying God’s Word and doing what He’s asked me to do. See, I’ve been looking for results in the wrong place. The issue is not with soil I’m planting the seeds in. The issue is with the seed spreader. Me! Maybe the harvest the Lord wants to reap isn’t in that other person right now. Maybe the harvest is supposed to be in me! So I asked the Lord to soften the soil of my heart toward that certain somebody who is really hard to love. I asked Him to love that person through me. And He has been answering my prayer! I’m not giving up on love! I’m not giving up on that person! I’m choosing to keep planting seeds of love, even in this difficult soil. Have I seen any results? Not in that person, no. But that’s okay. That’s in God’s hands. I just have to be faithful to plant seeds of love. Thank you for the encouragement, girl!